Paws and claws? No problem! 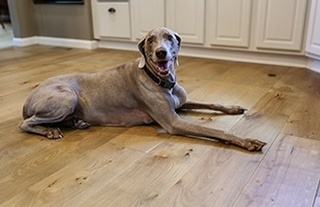 Wood floors are designed to withstand the traffic of busy families, including man’s best friend. Wood floors are extremely durable. They can withstand the rambunctiousness of a puppy and still look beautiful for decades. Just be sure to pick a species that can endure Fido’s playful spirit, sharp nails, and occasional accidents. Each species of hardwood has a different level of hardness. Some common domestic species like walnut, cherry, and birch are less hard in comparison to other common domestic species like maple, hickory, and oak. The hardness of solid wood is measured according to a system called the Janka Scale. 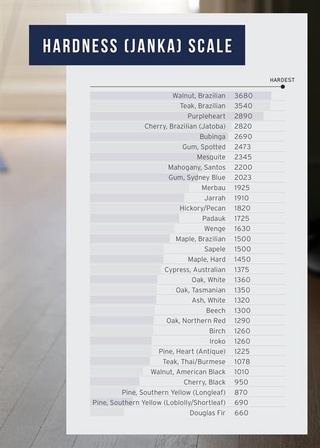 The Janka Scale gives a good indication of how well a wood species can be expected to withstand dents and dings. The scale is determined by the amount of pound-force required to push a .444-inch diameter steel ball halfway into the wood. Ratings for both domestic and imported species are included in the scale; however, none of these values apply to engineered wood flooring. While Janka values give a general sense of how hard solid wood is, other factors also contribute to the durability of wood as well. This can include things like how the wood is cut and the finish that is applied to the wood.